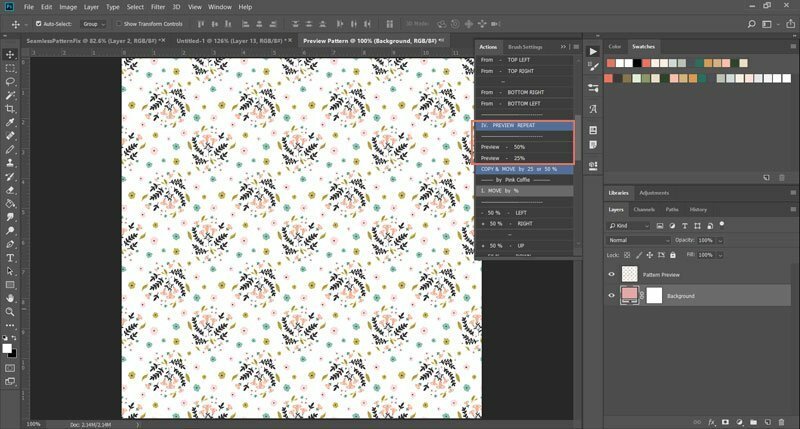 Make seamless patterns using Photoshop actions ~ Elan Creative Co.
Do you use Photoshop for pattern design? Well, I rarely do because I find it harder to use than Illustrator. Fortunately, now we can make seamless patterns using Photoshop actions. Disclaimer: This post contains affiliate links. That means I get a small commission if you decide to make a purchase using my affiliate link. However, I love this product, and I wouldn’t recommend it if I didn’t find it helpful. 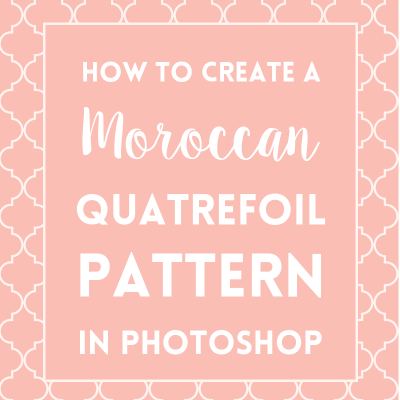 I recently discovered something that will change the way we make patterns in Photoshop. 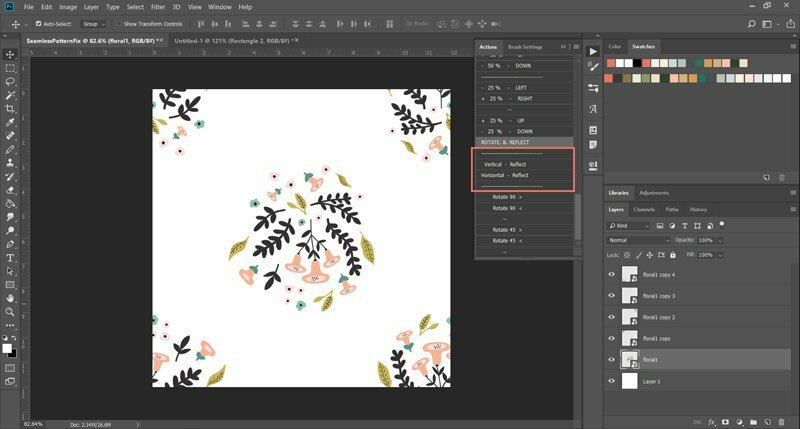 The Seamless Pattern Fix is a set of Photoshop actions made by Pink Coffie that will speed up your workflow and help you design complex patterns in no time. 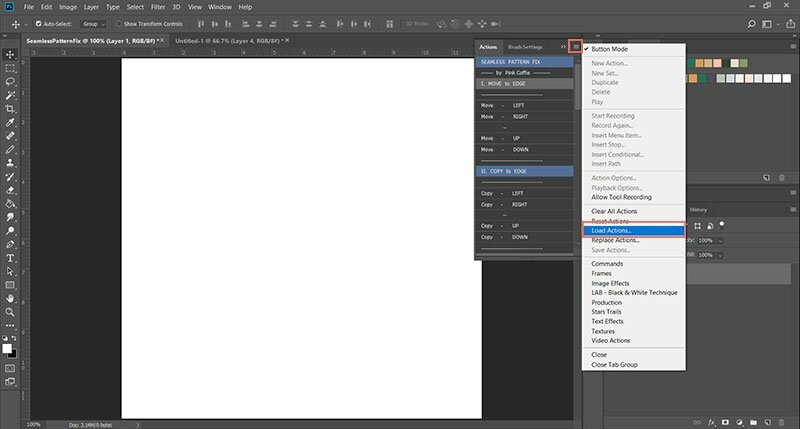 If you are not familiar with Photoshop actions, you have to try them. It’s a feature that allows you to save certain steps and apply those steps to any image. The most used Photoshop actions are those that allow you to add certain filters and effects to your photos. Rotate & Reflect: will help you rotate illustrations without having to use the Transform or Free Transform options. 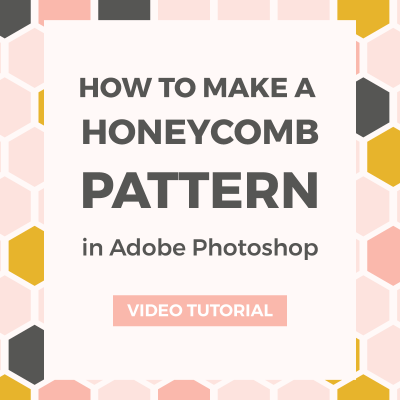 These actions will change the way you create patterns in Photoshop. Instead of the old method that uses the Offset filter, you will be able to create patterns in a way that’s similar to Illustrator. Plus, they speed up the process! To install the Seamless Pattern Fix or any other Photoshop action, just go to Window > Actions (Alt + F9) to open the Actions window. When the Actions window is open, click on the Settings button that’s in the top right corner of the window. Select the action you want to load, and press the Load Actions﻿ button. Do the same things for all the other actions. Once your actions are loaded, you can change the way they are displayed by going back to the Settings menu and selecting the Button Mode. This mode simplifies the way your actions are displayed and it works really well with the Seamless Pattern Fix. First, create a new document. You don’t have to worry about the size because the Seamless Pattern Fix works with any size you want. 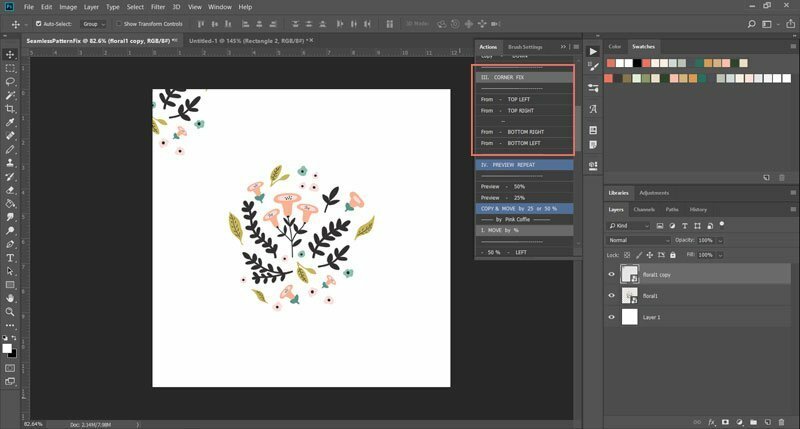 Drag and drop the illustrations into the center of the canvas. I’m using a floral arrangement that I made for my Autumn Flowers pattern collection. I want to make a grid layout with these flowers and cover the empty space between them with smaller flowers. First, I’m going to use the Copy & Move action to create a copy of this illustration and move it to the top left corner. Select the illustration, then open the Actions panel and scroll down to the Copy & Move action. Click on – 50% – Left. To move the illustration to the top left corner, just go to the Move by % action and click on + 50% – UP. As you know, when you make seamless patterns, everything that’s on the left side has to be duplicated on the right side, and everything that’s on the top needs to be duplicated on the bottom. In Photoshop, when we add illustrations over the edges of the canvas, a part of them will not be visible. That invisible part needs to be visible on the opposite side. This is where the Seamless Pattern Fix comes in. I want to move a copy of the illustration to the right edge. The part of the illustration that is hidden in the image needs to be visible. In order to have a seamless pattern, the two sides need to fit perfectly. Select the illustration you want to duplicate. 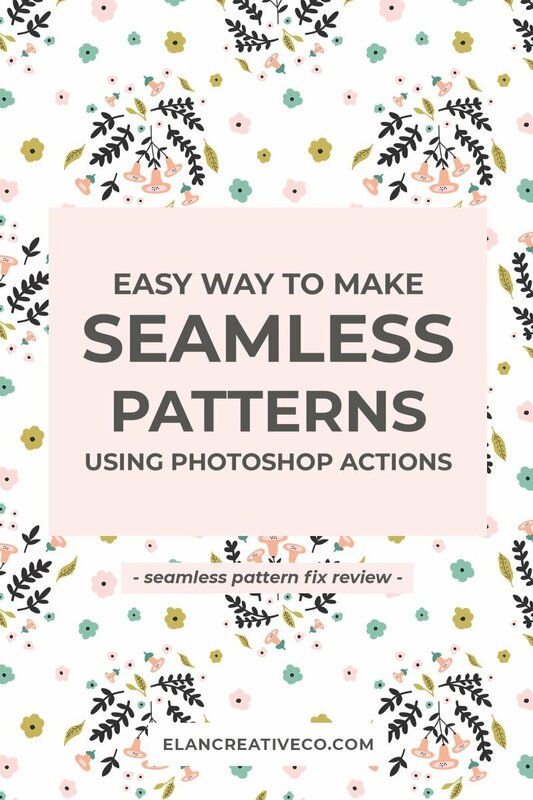 Go to the Actions panel and find the Seamless Pattern Fix action. I’m going to use the Copy to Edge option. My illustration is in the left corner so I’m going to click on Copy – Right. And just like that , there’s another illustration in the right corner! Because my illustrations are in the corners of the canvas, I’ll have to make copies of both of them on the bottom of the images. To do that, you can either select the illustration and use the Copy to Edge option to duplicate it, or you can use the Corner Fix. I have an illustration that is in the corner of my canvas. A part of it goes over the top edge and another part goes over the left edge. Instead of creating three more copies, I can use the Corner Fix action. Just select the illustration you want to copy, then go to the Corner Fix action. My illustration is in the top left corner so I will click on From Top Left and it will create copies in all the other corners. I like to add a bit of movement to my patterns, so I often change the orientation of my motifs. Select the illustration you want to rotate, go to the Actions panel and find the Rotate & Reflect button. I’m going to going to use the Vertical Reflect button. The last step is to drag and drop a few small flowers on my canvas. I’m going to add some of them over the left and top edges and then I’m going to use the Seamless Pattern Fix to copy them to the right and bottom edges. The Seamless Pattern Fix also comes with a simple way to test your pattern. Go to the Actions panel and search for Preview Repeat. You can preview it at 50% or 25%. If you use these options, you will be able to see if there are any problems with the edges or if there are areas that need to be filled with other elements. 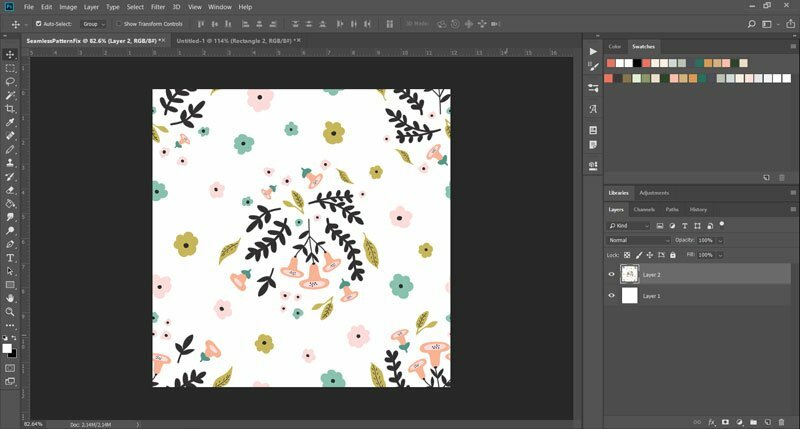 To save your seamless pattern as a Photoshop pattern, just go to Edit > Define Pattern and give it a new name. 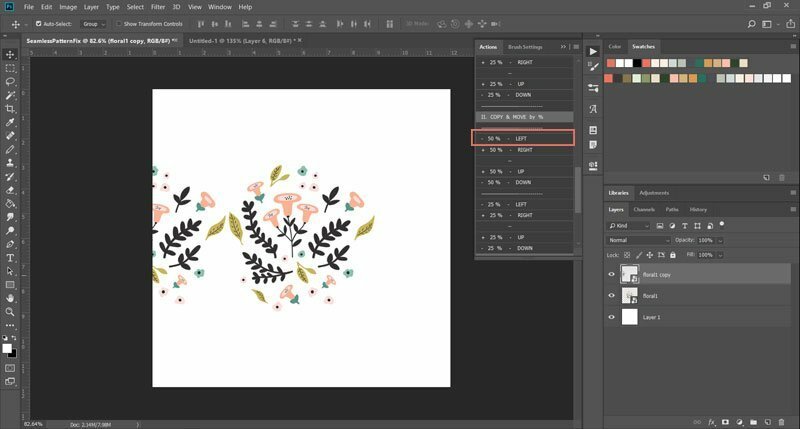 You will be able to use the pattern by going to Edit > Fill, you can add it as a Fill Layer from Layer > New Fill Layer > Pattern, or you can use it with the Fill tool. Another easy way to save your pattern tile is by going to File > Export > Export As and saving it as a JPEG or PNG file. 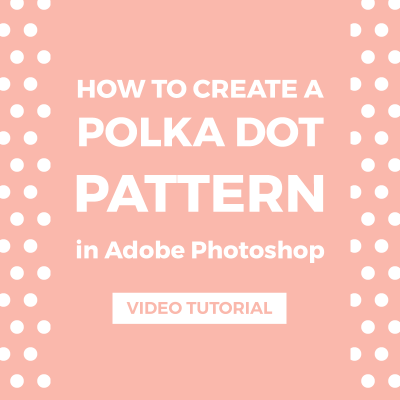 Do you make seamless patterns using Photoshop actions or do you like using the manual method? I have the action but I have trouble making it show the “preview” correctly. It just states the markee function is not working correctly (or something similar). I have been in contact with the creator but not got a response (yet). Maybe you know what I might be wrong as you use it? 🙂 I have the CC with the latest Photoshop. Hi Sandy! I’m sorry to hear about that! It works really well for me, so I’m afraid I can’t help you with that. I’m sure Urska will help you. I know she’s been working on updates. Hi Lisa! Are you trying to save the pattern tile or the repeat pattern made with the Preview Repeat option? If the pattern tile is too small, the only way to make it bigger is by using a larger document. If you’re having trouble with the PS actions, you should contact the author on Creative Market. When I make the pattern I did 400 x 400 and then save it. Define pattern. Then make a new document 3600×3600. Then new fill layer. I have also tried starting it with a 600×600 document but it’s still very small. That’s with the ps actions. And normal following your video. You should probably make a larger document. If you want to be able to scale the pattern, you should work with vectors and Illustrator.